I did a thorough blitz of the fridge this morning to find out what needed finishing up and what was beyond redemption (a turkey liver, and some rather manky parsley and spring onions that had slipped the net). That's not too bad but there's a fair amount of other stuff that will need using up over the next few days, most notably some very good goose stock, assorted bits of cheese and various root veg. As we're already feeling stuffed and dying for some spicy fresh-tasting food I've decided to have a batch cooking session and freeze the results. On the agenda, a chestnut and lentil soup, a quiche (have already made one this Christmas) and a banana bread or cake. I might also freeze some of the stock for risottos and some breadcrumbs and grated cheese for gratin toppings. I've managed to resist the temptation this year to stock up with those 'just in case' purchases that one rarely needs but need to guard against plundering the shops later this week for reduced Christmas goodies like puddings and panettone or cut price turkeys. Do we actually want to eat turkey or Christmas pudding again before next Christmas? Absolutely not. Do I need to nibble panettone after a week of stuffing myself? No, likewise. And my new year's resolution? To keep my fridge and cupboards tidy. Tidiness is not something I'm noted for, my family will tell you, but it's impossible not to waste food unless you know where things are and when they need to be used up. So have you made any food-related resolutions and if so, what are they? Last night we finished the final veg in our veg box. Yes, I know I said I wasn't convinced by them but I have now identified the circumstances in which they come into their own - which is feeding the family hoardes over Christmas. I didn't actually order one, I must confess. Someone from the veg box company Abel & Cole wrote and offered me a free one "as one of their favourite food bloggers" (obviously they say that to all the bloggers). Still, £15.95 worth of free fruit and veg is frugal by anyone's standards - who am I to refuse? It contained clementines, bananas and (particularly nice) apples, potatoes, onions, carrots, parsnips, green cabbage, leeks and mushrooms. Enough of each to be useful although our youngest son is capable of demolishing pretty well all the potatoes at a single sitting. And he's stick thin which is grossly unfair. I didn't do anything particularly unusual with them. Most supplied straightforward veg accompaniments to our Christmas meals. (No sprouts though which was odd, just before Christmas) We had garlic mushrooms on toast which you can find here on my student Facebook page, used one of the parsnips grated into the chestnut stuffing as we'd run out of carrots (rather good, actually) and made soup with the leeks. Will I be ordering a veg box from now on? No, 'fraid not. I still prefer to go to the shops and see what's looking good rather than have a pre-selected box imposed on me and still reckon it's cheaper to buy fruit and veg direct. But if I was veggie, had kids at home and/or was working (as in going out to work rather than working from home) then I might. Which I suppose is a result for Abel & Cole. There is a large half-eaten turkey sitting in the shower. Why? Because it won't fit in the fridge, the kitchen is too warm and anywhere else my daughter's visiting cat would get at it. (It has already half-demolished our landlord's pot plant - the cat, not the turkey, obviously) The health police would of course be appalled but we didn't finish eating till 10 o'clock last night so there was nothing else to be done. Today will be devoted to ensuring it doesn't go to waste or that we don't get driven mad by endless turkey meals. My usual strategy is to have it cold for lunch on Boxing day (By far the best meal of Christmas IMO) then to prepare little parcels of white and brown meat for other uses and make stock with the carcass. My youngest son particularly likes the brown meat fried up till crispy with the leftover turkey gravy so that takes care of some of that. 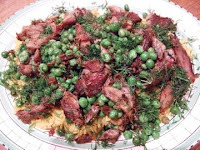 I usually make a rich turkey and mushroom lasagne or a korma like the chicken one I cooked on You and Yours the other day but if I can find some tarragon I may try and make the splendid jellied terrine in the book which comes from a food writer friend of mine, Andrea Leeman. The stock makes terrific soup but is so rich it tends to overwhelm more delicate vegetables. I like it for a chestnut soup (I do have a few leftover chestnuts, happily) or a dark mushroom soup or risotto. It's good with lentils too. Incidentally I managed - yet again - to buy a larger turkey than we needed, largely because the butcher had run out of smaller birds by the time I got round to ordering one. (Memo to self, order earlier next year). We usually stretch the turkey anyway by serving plenty of sausages as well as the stuffing so there really is no need for an outsize bird. I did however manage NOT to buy a Christmas cake (my daughter made a chocolate one which has already been scoffed) or any dates, figs, nuts or excessive quantities of cheese or twice as many sprouts as we needed so the cost of Christmas is well down. And you know what? We didn't miss any of them. How did your Christmas go? Any bright ideas for the leftovers? With just over 24 hours to Christmas Day and even less till the shops close I have just two words to say to you. Don't panic! Even if you have to nip out to fetch a few last minute ingredients like fresh bread or milk don't feel you have to sweep up everything else that's on offer in your wake. The shops will be open again on Saturday, some probably on Friday. You more than likely have enough food in your fridge and freezer to last till January 27th, never mind December 27th. If you find you haven't got something you need it's not the end of the world. Improvise, substitute or get a family member or friend to bring it with them. Just do yourself a favour and avoid that final mad rush . . . I really love braised red cabbage but, perhaps because it takes so long to cook, don't make it that often. However they had some at the farmers' market yesterday so I thought I'd make a recipe I used to make eons ago from The Penguin Freezer Cookbook. It went with our first really Christmassy meal of the holiday - roast duck (£6 from Somerfield) with roasties and red cabbage. It fed four and there's enough left over for at least four more portions, maybe six. I've frozen it for a night when I don't feel like faffing around with vegetables. Ideally you should use a sharp apple like Bramleys but I had some slightly tired eating apples I wanted to use up which were fine. 150ml red wine + extra to taste. Heat the fat or oil and cook the onion over a low heat for about 7-8 minutes until soft. While it's cooking cut the cabbage into quarters, remove the central core and slice finely. Stir the garlic into the onions then tip in the cabbage, stir thoroughly and continue to cook in a covered pan over a low heat until it starts to collapse and reduce in volume (about another 10 minutes). Quarter, peel, core and slice the apples and add them to the pan along with the cloves and a heaped tablespoon of sugar then pour in the red wine. (You can see from the picture what it looks like at this stage.) Bring to the boil then turn right down and leave over a very low heat or in a slow oven for about 2 - 2 1/2 hours, stirring a couple of times. Check for seasoning, adding a little more wine and salt and pepper to taste. Serve with roast duck or pork, beef or venison sausages or a beef stew. It was a curious attitude for such a programme to take. I would have thought, like Jamie, they would be all for encouraging people to cook from scratch. The point I made was that there was not only more meat in my curry but that it it tasted fresher and was healthier than most shop-bought versions. At least they admitted the end result was delicious! The point I didn't have time to expand on is that it's a recipe that you could easily run up with leftovers (do try it with the Christmas turkey). If you're going to cook frugally you need to be flexible, cooking with what you have rather than going out to buy new ingredients. You could use an ordinary onion, for example, rather than spring onions or a combination of double cream and yoghurt rather than creme fraiche. You don't have to use turmeric if you don't have any though if you do it improves the colour. You could use another kind of curry paste - it doesn't have to be korma. And you can pay less for the coriander than I did if you buy it in an ethnic shop and still have plenty over for the rest of the week's cooking. Frugal cooking is all about improvisation. Watch the prices of goods supermarkets are NOT promoting! At first glance food prices seem to be easing with every shop offering dramatic discounts, particularly on those items that people will be looking for over Christmas. (Like smoked salmon) But have you noticed how the cost of items they're not promoting has been shooting up? Yesterday, for instance, I found small (150g) pots of plain yoghurt selling in Somerfield for 74p - only 16p cheaper than the large pots. But many people living on their own wouldn't need a large pot. And now everyone's jumping on the Aldi bandwagon of having six fruit and vegetables at a knock-down price all other fruit and veg seem to be costing far more - including the quite ludicrous price that supermarkets charge for a tiny pack of fresh herbs. It goes to show just how important it is to know what things normally cost and keep your wits about you when you shop. Have you spotted any examples of excessive price rises? Of course that’s not the whole story. There’s a pleasure in making and eating home-cooked food that ready-bought products simply can’t provide. My kids would all be outraged if I served up a packet sage and onion stuffing instead of our traditional chestnut one or deprived them of the pleasure of making mince pies together in the kitchen. I also want to support my local shops over the Christmas period to help them stay in business at a difficult time. So what are you doing - have you bought in your Christmas staples or are you making your own? Funny how things go out of fashion. When I was young almost any restaurant you went to served a selection of hors d'oeuvres (literally 'out of the work' or in other words an addition to the main course). It was a way of extending and reducing the cost of the meal and using up leftovers and very tasty it could be too. You can still find similar dishes in France and Italy but rarely in England. It's a tradition that deserves to be resurrected because it's a cheap way to entertain. Today we laid on three dishes for friends as a starter - just-cooked leeks dressed with a sharp vinaigrette, topped with chopped hard-boiled egg, a beetroot and yoghurt salad with dill and a Moroccan(ish) carrot salad with an orange dressing. My husband made the last two so I can't tell you what was in them (nor, almost certainly, could he - he's a great one for a pinch of this and a pinch of that) but here's the leek recipe, which is adapted from A Taste of Somerset by Andrea Leeman. All would be good for Christmas entertaining. Trim the ends and tops off the leeks, leaving some green. Cut lengthwise two thirds of the way down the middle and rinse thoroughly between the leaves. Cut into even-sized lengths (about 4-5 cm long) cutting the larger leeks in half. Put in a large shallow pan and pour just enough boiling water to cover the leeks. Bring back to the boil, cover and cook until the leeks are tender (about 3-4 minutes) Transfer to a colander with a slotted spoon or spatula and rinse with cold water. Leave to get completely cold. Whisk the vinegar with the salt, sugar and pepper and gradually whisk in the oil. Gently squeeze any excess liquid out of the leeks, arrange in a serving dish and spoon over most of the dressing. Arrange the chopped egg in lines down the dish (see pic) or simply scatter it over the leeks and sprinkle over the parsley. Spoon over the remaining dressing and serve. As well as a weakness for food I have a fondness for kitchen kit so it probably wasn't a good idea to head off yesterday for T K Maxx. Actually it was sheer frustration at the prices in John Lewis which is supposed, as they oddly put it, to be 'never knowingly undersold' but which always seems pretty expensive to me. We were after a large cast iron casserole and most of the ones we were looking at were £80 even after a 20% discount, sparked by reductions at one of their competitors. TKM didn't have cast iron casseroles but it had huge beautiful baking dishes for a song. The red one above, part of the Typhoon Vintage Kitchen range cost £6.99 for a dish which will easily serve eight (yes, it is upside down in the picture but I couldn't think of a better way of showing what a fabulous colour it was!). 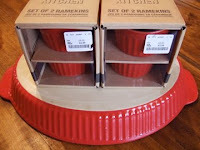 I also snapped up four dinky red ramekins from the same range for £2.99 a pack of two instead of £8 a pack and a couple of really nice retro mixing bowls for £3.99 each. Oh, and a couple of James Martin knives reduced from £10 to £3.99 and £16 to £7.99. I generally mistrust celebrity chef-endorsed products but these were beautifully balanced with good non-slip rubber handles. I justified all this extravagance at the time on the basis that they would make great Christmas presents but will be sorely tempted to keep them for myself . . .
And now for frugal drinking! I've been thinking for a while of starting a frugal drinking blog including beer, cider and other drinks as well as wine. It's actually the other part of my working life (I used to write a regular column for the Daily Mail!) but it never seemed to quite fit in with this blog. It struck me though that it would be pretty useful, particularly in the current economic climate. We like to drink well but we don't spend a lot of money on doing so. I happen to think that drinks like beer and cider are underrated and that there are a lot of bargains out there that people don't know about or are unsure whether it's OK to buy because they don't know that much about wine. So I've kicked it off, it's called Credit Crunch Drinking and you can find it here! So how much food do we REALLY need at Christmas? Just as in England, the French papers are full of full page ads for Christmas food. And probably have been for some weeks. I guess the thinking behind these campaigns is to panic people into getting ahead with their Christmas shopping, keep reminding us of things we think we might need and then assault us with a whole raft of last minute bargains we can’t resist. The net result is that we all buy way, way too much, behaving as if we’re going to be subject to a month-long siege during which we will be unable to get to the shops. Where I live in Bristol, I suspect I could probably go to my convenience stores on Christmas Day if I chose. Certainly I’ll be able to shop on Boxing Day. True, some ingredients such as fish and fresh vegetables are harder to find between Christmas and the New Year but I’m sure there will be something to eat. So this year I’m going to make a resolution - to try to end up on January 2nd without my fridge crammed full of food that’s on the verge of going off. 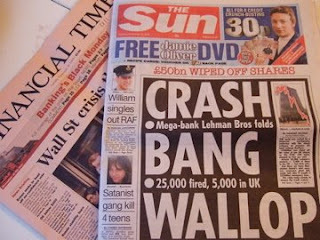 How are you all coping with the non-stop 'spend, spend, spend' bombardment? Any good tips? You simply trim and chop up a bunch of spring onions and soften them in a little oil and butter, chuck in a handful of lettuce leaves and some chopped parsley stalks, let them wilt then add about 200g of frozen peas, a cooked, sliced potato, a handful of parsley leaves and about 500ml of vegetable stock, bring to the boil and simmer for about 3 minutes until the peas are cooked. (You need to cook the potato first otherwise the soup will take too long and the peas will lose their fresh green colour). Cool for 5 minutes then whizz in a blender or food processor, return the soup to the pan then add another 200ml or so of stock or milk and heat through. You can sieve the soup if you want a smoother texture or whisk in a bit of soft butter or cream for a more luxurious taste. A squeeze of lemon juice doesn't go amiss. With it we had some crostini topped with fromage fort, a brilliant French way of using the assorted odds and ends of cheese from the fridge. No exact quantities. I used a bit of leftover goats cheese log and Brie (both with the rinds removed and a rather sad bit of Appenzeller which had seen better days. You simply blitz a clove of garlic in a food processor, add the cheese (sliced or crumbled) and whizz till you have a smooth paste then add just enough white wine to give a spreadable consistency. Season with cayenne pepper, chilli powder or hot paprika. There was enough soup left over for a couple of extra little cupfuls last night before a main course of a shepherds pie-like dish salvaged from the remains of last week’s braised beef topped with celeriac mash which I’d stashed away in the freezer. I must say it felt good not to be chucking out food this morning. Communication may be spasmodic this week. Back next weekend, if not before . . . Being a traditional sort of loaf it was still perfectly fresh. We froze half of it and have been using the other half for toast. I couldn't resist this offer when I spotted it in Somerfield the other day even though it broke one of my cardinal rules of not buying something you're not sure you can use up. Admittedly it wasn't a bad buy. We had family staying overnight, the cheeses individually would have come to over £7 and they were all versatile cheeses - a goats' cheese, a Brie and a piece of mature Stilton from the so-called 'Best Ever' range - which one could use in any number of ways. I managed to use up a good chunk of the goats' cheese this lunchtime with a spontaneous salad of lightly dressed leaves topped with some roughly-torn croutons, made from leftover bread I baked off quickly in the A*A (won't bang on too much about that, notSupermum!) but could easily have made when I had the oven on for something else. The Brie, which should last a few days longer, can easily be turned into a toastie or melt and the sell-by date on the Stilton is not till the 17th so there should be plenty of opportunity to use that up. Just a shame that my husband doesn't eat cheese . . .
What's wrong with a bit of mud? Don't know if you've noticed but one of the things that's been sneakily creeping up in price is parsnips. There was a time when they were one of the cheapest vegetables around during the winter months. Now, like many seasonal veg it seems, they sell at a premium. Unless they're dirty, that is. Yesterday I bought a handsome quartet at my local greengrocer for just 48p a lb. In Tesco they were selling at over twice as much at £1.28 for a 500g pack. Just because they were washed. I'd rather have my parsnips dirty, thankyou - and my carrots and spuds (£1 for 5lbs at Terry's) It only takes a couple of minutes to scrub them clean. Worth 50p in anyone's book I would have thought. What do you reckon? Do you mind a bit of mud or does it put you off? OK, ok. I give in. I'm now a card-carrying member of the AGA fan club. Yesterday I had an amazing late afternoon shopping raid on our local Somerfield which turns out to be frugal nirvana (being a noted student haunt). When we arrived at about quarter to five they were marking meat down and I picked up 350g of lambs liver for 41p and a 1.75kg pork joint for just £1.64 - both reduced by 75%. Problem was both needed to be used by the end of yesterday. I was going to marinate the pork but reckoned, on unwrapping it, it needed to be cooked straight away. So I thought I'd risk cooking it overnight in what's called the simmering oven. I smashed up a teaspoon each of coarse salt, black peppercorns and fennel seeds and 1/2 teaspoon ground chillies with my mortar and pestle then added 3 chopped cloves of garlic to make a coarse paste. I rubbed the joint with olive oil and smeared the paste into the meat and skin then rubbed in a bit of lemon juice (yes, messy, but fun). Then I put the joint in a roasting tin with a slosh of white wine and water, gave the meat 10 minutes in the hot oven then transferred it to the simmering oven. I wasn't quite sure what to expect when I took it out this morning, 9 hours later - or whether we'd be woken by the fire alarm in the middle of the night - but it was utterly fantastic. No crackling but just fabulous, fragrant, spicy meat and loads of gorgeous pan juices which are settling as I write. Unbelievable! The only downside was that we couldn't really eat it hot at that time of the morning though we did manage a few greedy slivers for breakfast but it will make great cold cuts and sandwiches for a couple of days. If you haven't got an Aga you could equally well do this in a very low oven - about 130°C/250°F/Gas 1/2, I would think, having given it a bit of a blast first to get it going. Oh and the liver was good too. I made a Turkish recipe called Kebda which is simply sliced lambs' liver dusted in flour (2 tbsp) mixed with 1/2 a teaspoon salt and 1 teaspoon each of ground cumin and sweet paprika, quickly fried and seasoned with lemon juice. It's nice with a dollop of yoghurt and some chopped coriander but we didn't have either and were certainly not going to spoil our feeling of smug satisfaction by buying overpriced herbs . . .
Over the years I’ve come to realise that book launches are a bit of a waste of time (a view that publishers tend to share). All the key journalists have got the book by the time it takes place and those who take the trouble to come to the launch would almost certainly have written about the book anyway. Sure it’s an opportunity to have a great party and that’s not to be sniffed at but it’s not actually necessary. We also had ham and split pea soup, fabulously gooey cheese croquetas (one of the best ever frugal recipes, I’m rather sorry I didn’t put in the book) and two tasty offal dishes, a casserole of lamb hearts with lentils and lambs’ liver with pinenuts, raisins and sherry which even the offal-haters in the party happily wolfed down. Oh, and a chocolate bread and butter pudding on which I was slightly less keen but I like my B & B pudding unadulterated. 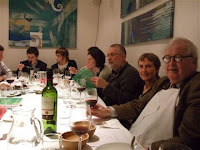 The whole event was not only a great illustration of the ethos of the book but very much in the spirit of Slow Food - convivial sharing of traditional home-cooked dishes. It also proved how well you can entertain on a budget and that there’s nothing wrong with basing such a meal on humble ingredients and leftovers. Result! Anyway the first was about bin-ends. The other day I bought 13p's worth of red kidney beans in our local health food shop out of curiosity to see how much I would get when they were cooked up. And the answer was at least as much as you get in a 400g tin which are currently selling for about 50-60p if you buy them singly. True, you have to soak them overnight (not time-consuming, just a matter of remembering) and cook them for about an hour - unless you have a pressure cooker and you know what my feelings are about those - but they do also taste a great deal better than canned beans. Since my last post we've moved to a new flat and have taken over an Aga in the process. Combined with the zillion packing cases that are cluttering up every square inch of the place the thought of cooking - or anything else remotely domestic - is a daunting prospect. Our landlord reassured us it was easy so I'm sure we'll get used to it. My husband insisted we made Aga Toast for breakfast this morning, a legendary delicacy apparently among Aga owners. You clamp your bread between a double-sided wire toasting rack, put it for literally seconds on the hot plate and, bingo, you have the most gorgeous rough-hewn, slightly charred toast (below) It reminds me of making toast in front of an open fire. It may take a few days for normal service to be resumed so bear with me . 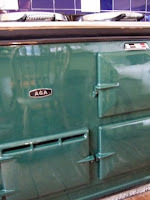 . .
PS Do any of you have an Aga or have you ever cooked on one? If so, some tips please about the best way to use them - what they're good at and any potential pitfalls to watch out for. Yesterday I went down to St Nicholas market to be interviewed about ‘Frugal’ by the Bristol Evening Post, an opportunity to do a bit of browsing at my favourite new food shop and café Taste@St Nicks. They were selling Penclawdd cockles from the Gower peninsula, a delicacy you don’t often come across. I remember having them deep-fried when we were there earlier this year and they were fantastic. And at £1.80 a 100g (all you need for two) they’re a thrifty buy. Heat the oil in a frying pan over a moderate heat and add the bacon. Cook for a minute until the fat starts to run then add the onion, stir, turn the heat down and cook for about 10 minutes until the onion is soft and beginning to brown. Stir in the crushed garlic, cook for a minute then turn the heat up a bit and add the white wine and fish sauce. Bubble up for a minute then take the pan off the heat, tip in the cockles and set aside. Cook the spaghetti in boiling water for the time recommended on the pack. Spoon off 2-3 tbsp of the cooking water into the bacon and cockles then drain the spaghetti. 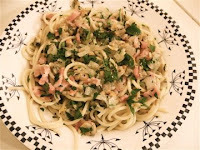 Return to the pan, heat through the sauce, tip it over the spaghetti along with most of the parsley and toss together. Divide the spaghetti between two warm shallow bowls, drizzle over a little olive oil, add a few grinds of pepper and sprinkle with a little more parsley. A press release from What Consumer? passed on by a food writer friend draws up a list of Ten Top Money Saving Tips for Food Shopping. "You will see how much the inclusion of meat in any dish drives up the price" reads tip no. 4 "Experiment with cheaper substitutes such as oyster mushrooms instead of chicken and pancetta instead of bacon." Hello! Quite apart from the fact that pancetta isn’t a non-meat substitute for bacon it’s more expensive. As are oyster mushrooms, weight for weight, than cheaper chicken cuts. At the same time Ocado co-founder Jason Gissing is apparently telling us that sales of mince are "rocketing" as people cook more at home while little treats such as doughnuts and smoothies are “plunging”. I’m sorry, Jason, I just don’t buy that either. Most people who shop frugally include mince regularly in their repertoire already and are unlikely to double or treble their consumption. And if the economic climate is getting you down I would have thought that you were MORE likely not less, to buy a doughnut. What planet are these people living on? Another silly story designed to grab the headlines is Norwich Union's assertion that by 2018, we could be paying £5.35 for a pint of milk. Well, I guess it’s hypothetically possible, but it’s not very likely and if Norwich Union genuinely thinks we’re all going to rush off to stuff our savings in their low-paying accounts simply to be able to pay the milkman in 10 years time they’ve got another think coming. As the author of the piece on the MSN Money Channel points out, the amount we spend on food has actually fallen in the last 50 years. We spend just 15% of our earnings on it compared to a third just after the war. PRs seem to have got it into their heads that any story with the words ‘frugal’ or ‘credit crunch’ in it will automatically hit the headlines. Which I suppose is good for the book and this blog so I shouldn’t complain but it does seem mildly ridiculous. 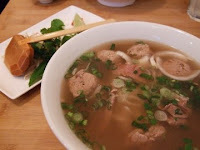 A couple of days ago my daughter and I checked out a Vietnamese noodle bar called Pho, conveniently near Oxford Circus. It specialises in Pho (pronounced fuh), an unbelievably addictive, tasty noodle soup, not flattered by the rather murky picture to the right. The basic broth, which usually includes some kind of meat, is quite bland - you zip it up to your own taste with fresh herbs such as coriander and mint, chillies and/or chilli sauce and fish sauce. I thought they were slightly stingy about the herbs. I haven't been to Vietnam but have eaten a similar soup in Bangkok where you got a great jugful on the table. But it's tasty and, as they correctly point out, very healthy. My Pho Tai Bo Vien which also included meatballs was £7.45, not bad for a West End lunch though probably 10 times the price you would pay in Vietnam. I suspect you could also find it more cheaply in the Vietnamese restaurants along Kingsland Road in Hackney though I haven't been down there for a while. I've also had a go at making it at home with reasonable success - you can find the recipe on my student website www.beyondbakedbeans.com. Would you, should you eat a budget sausage? Given that it’s British Sausage Week and Bonfire Night tonight you’d expect a few offers on sausages this week but few can be as cheap as the 88p that Tesco is charging for its discount brand Tulip. Curious to see what you get for an 11p sausage I bought a pack of eight. According to the ingredients just 56% of the sausage is pork (compared to about 70-80% for mid-range sausages and 85% plus for premium ranges). The rest is accounted for by pork rind, and pork fat, water and rusk together with a whole load of additives including stablisers which are presumably needed to keep the whole soggy mixture together. There’s a fair amount of salt (1.2g per 100g) plus a surprising amount of sugar (4.2g per 100g)which presumably accounted for the fact they browned so easily (see picture). Two sausages alone would account for over a third of the recommended 3g daily salt intake for a 4-6 year old. When I fried them an alarming amount of fat also leached out of them - I spooned off about 7 tablespoons, but it has to be said the flavour wasn’t at all bad. They were a bit pappy and soft but I’ve eaten a lot worse in my time. You can see why they would appeal to a family on a really tight budget (not to mention the students who patronise that particular Tesco store). I don’t know whether to feel pleased or sorry that they are not made from British pork but ‘EU’ pork which could come from anywhere from Holland to Romania. I doubt if British farmers could afford to do them for that price but given the financial plight they’re in I’m sorry that Tesco is willing to undercut them in this way. I'm pretty sure the 11p sausage doesn’t pay for fair wages or high standards of animal welfare. If you look at the head of broccoli above you'll see about a third of it is stalk. A third, I have to confess, that I used to throw away. Since writing the book I know better. There had to be some better use for it - and there is. It makes really good soup, along with whatever other vegetables you might have available. You might think this is so blindingly obvious as to be laughable and always use your broccoli stalks that way but, as I said, I used to be less frugal than I am now. You need to trim it up a bit with a sharp knife or a potato peeler then cut it into small chunks and add it once you've sweated off your other vegetables. I used onion, celery and potato in roughly the proportions of the Sad Unloved Vegetable Soup here. Then just cook the vegetables in stock until they're tender. If you call it broccoli-stem (rather than broccoli-stalk) soup people will think it's some very cool recipe that Nigella has invented. And the rest of the broccoli? I cooked it as I often do which is to cut up the florets and stir fry them, adding about a tablespoon of soy sauce, 4 tablespoons of water and a little crushed garlic towards the end. Good hot, but oddly even better lukewarm or cold. I feel vaguely apologetic at having to confess I've been in Waitrose again but listen, I've got a new theory. Which is that no supermarket has a monopoly on bargains, even Lidl. All have really sharp offers these days. All have lines that are overpriced. You've just got to keep your wits about you wherever you shop. Anyway the bargain I spotted on this visit was pork 'osso buco'for £3.99 a kilo - about half the price veal osso buco would have been. The amount above (apologies to visiting veggies) was just £3.45, pretty good for more than enough meat for 4. It was free-range too. If you're short of time you could make the purée and freeze it then make the recipe for Thanksgiving in four weeks' time. If so, don't add the eggs, flour and cream at this stage. Just blitz the roast pumpkin, add the sugar, honey, spices and booze and freeze the purée in a plastic container. You may well have more than 500g of pumpkin in which case you could also try my young food writer friend Signe's yummy Hallowe'en butternut squash muffins on the Beyond Baked Beans site. She also has a really good blog of her own, Scandilicious. Next make the pumpkin purée. Preheat the oven to 200°C/400°F/Gas 6 Scrape away all the pumpkin seeds and fibrous pumpkin surrounding them and cut into even-sized chunks. Put the chunks on a piece of lightly oiled foil. Sprinkle over the bourbon, sugar and mixed spice and dot with the chilled butter. Bring the foil up round the sides and fold over carefully to form a loose but airtight package. Place on a baking dish and cook for 40 minutes until the pumpkin is soft. Carefully open up the foil, cool for a few minutes then tip the pumpkin and juices into a food processor or blender and whizz until smooth. Roll out the pastry and lower into the tin. Trim the edges and press the base well into the tin. Prick lightly with a fork and chill for another half hour. Cover the pastry case with foil and weight down with baking beans or dried beans. Bake at 200°C/400°F/Gas 6 for about 12 minutes then remove the foil and beans, brush the base of the pastry with the reserved egg white to seal it and return to the oven for about 3-4 minutes. Remove the flan case and lower the oven temperature to 190°C/375°F/Gas 5. Add the sugar and maple syrup to the pumpkin puree, then the spices, salt and bourbon. Add the eggs one by one, beating them in well then sift in the flour and mix lightly. Finally add the cream and pour the filling into the flan case. Put the tin on a metal baking tray, transfer to the oven and bake for about 50 minutes until the filling is just set and firm, reducing the temperature to 180°C/350°F/Gas 4 after about 25 minutes. The starting point for several meals was a butternut squash I'd forgotten about. Fortunately they last an age. I'd planned to explain on my student website Beyond Baked Beans how to cut up and cook one (now done) but have managed to stretch it into several days eating for one. I made some soup with the whole half (that sounds wrong but you know what I mean) and put half the cut up roasted squash and other veggies in a small oven proof dish mixed with some steamed sprout tops I had left over. Then I laid over some slices of Maroilles I was checking out for the cheese book and flashed it under the grill. That was REALLY good! Those slightly stinky washed-rind cheeses are great with squash - and greens - but you could easily use Cheddar or even Brie. The next day I chopped up the rest of the roast veggies and mixed them with a bit of cooled couscous I'd made up with some light vegetable stock and chucked in some toasted seeds and chopped coriander (I could have used parsley). Nice too and quite different from the previous night's meal. I could also have made a butternut squash risotto if I'd felt so inclined but that didn't seem worth doing for one. Anyway I got four meals out of it and it probably would have stretched a bit further if I hadn't been quite so greedy . . . It's never occurred to me to join the WI (I'm not much of a joiner, to be honest) but they certainly seem to be putting the 'Jam and Jerusalem' image firmly behind them these days. First there was 'Calendar Girls', now it seems they're in the vanguard of efforts to cut down on the nation's food waste. According to a report in the Independent on Sunday yesterday they've pioneered 10 'Love Food' local groups across the country, with the help of the Love Food, Hate Waste campaign and have been swopping tips and inspiring each other to help cut their food bills. One mother of four has cut her monthly bill by 50% from £800 to £400 (though £800 does seem a fair amount to be spending on food in the first place). You can find accounts of how the groups were set up and some great recipe and storage tips on the WI website and a Love Food Champions Workbook here. There's an interesting list too of the fruit and veg we waste most often which are, apparently, apples, potatoes, bananas, oranges and tomatoes. I'd agree about potatoes which very rapidly go green these days and bananas are hard to retrieve once they go really mushy but I don't tend to find the others too problematic. What about you? News in the papers today that Lidl is selling £4.99 lobsters. And - not surprisingly - that they're being snapped up. It's a bit like the stunt which Woolworths pulled a year ago, selling a 'basics' champagne for £5 a bottle: much less about perceived market demand (we can all live without lobster, for goodness sake) but getting new shoppers into their stores. Of course, as any frugal cook knows, this is not a real bargain. There's not much meat on a lobster. You'd need a whole one for a main course which, if you were serving it to 5 guests (plus yourself) would result in a bill for £30 for that course alone - never mind the champagne you'd want to drink with it. Just think how many prawns you could get for that! What do you think of Lidl's offer and would you be tempted by it? I've got a bit of fixation about sprouts at the moment having discovered they are quite ridiculously healthy. Not only does an average 80g serving contain more vitamin C than an orange but they apparently contain higher levels of cancer-fighting compounds than any of their fellow brassicas including broccoli. People hate them though, don't they? And for good reason. If they're boiled too long - as they generally were when I was a kid they go disgustingly soggy and sulphurous. I don't like them raw, I must admit, which is the best way to eat them from a health point of view but I've taken to stir frying them which works really well with either garlic, ginger and soy or with onions and bacon. And then there's brussel tops (or should it be brussels tops?) which are at the tip of the plant and until recently were discarded or fed to cattle, my local greengrocer told me yesterday. He was selling them for 48p a lb (he steadfastly refuses to go metric) and the head above - enough for two - cost me just 17p. I love them. The leaves are sweeter than cabbage, delicious steamed and tossed with butter or shredded and added to a soup or a stew. Enough to make you feel smug on every count - taste, health and cost! Annoyingly my husband is just as smart a shopper as I am, if not even more frugal (unlike me, he doesn't get easily distracted from the task in hand). His bargain buy this week was three tins of sardines for £1 in Somerfield. He likes sardines. I do - sort of. I know we're all supposed to eat a couple of portions of oily fish a week but I struggle. They just taste very . . . oily and fishy and look rather miserable and unappetising unless you jazz them up a bit with other ingredients which is what I did with two of the tins (above). You simply break them up roughly into a bowl, add a little grated lemon rind and a squeeze of lemon juice, a little chopped onion or chives and a couple of spoonfuls of chopped parsley, season with salt (not too much) and a generous grind of black pepper, pile them on wholemeal toast and you've suddenly got yourself quite a tasty little lunch for two particularly if you scatter a few cherry tomatoes round the plate. How do you get on with oily fish? Are you a sardine-lover or a loather? I finally managed to track down some ox cheek, not from Waitrose which has so far failed to stock it locally despite a barrage of publicity a couple of weeks ago, but in my local butcher Sheepdrove. They’d obviously responded to the Waitrose offal initiative: an assistant told me they’d never sold ox cheek as a separate cut up to now - it just got chucked in with the mince - but they’d had several requests for it. I bought 485g for just £2.52 which is amazing for organic beef but found I ended up with quite a bit less once I’d trimmed off all the connective tissue of which it has rather more than the average braising cut. Then we invited a couple of friends to supper so I had to make it stretch for four - in the time-honoured frugal way by cutting the meat up small, making a lot of sauce and serving extra vegetables. Ox cheek needs long slow cooking which is fine with me, at the end of which it has a meltingly tender texture. I cooked it with a rich dark beer which worked really well though you could equally well cook it daube-style with leftover wine. Or simply with beef stock. I also added a dollop of fig chutney which was rather nice (you need a touch of sweetness when you’re cooking with beer) and a counter-balancing dash of acidity in the form of a spoonful of malt vinegar. The end result was delicious, every bit as good as a stew made with a more expensive cut. Hopefully ox cheek will remain a bargain but somehow I doubt it . . .
Preheat the oven to 140°C/275°F/Gas 1. Cut the beef into small cubes, carefully removing any large bits of sinew or connective tissue (there’s quite a lot so just take out anything you think looks tough). Heat the oil in a frying pan and fry the cubes quickly until lightly browned and transfer to a casserole. In the same oil cook the onion until starting to soften then add the carrots and cook for a few minutes more. Stir in the allspice and flour then add the stock and beer and gradually bring to the boil. Stir in the chutney and 1 tablespoon of the vinegar, add the bayleaf if you have one then put a lid on the casserole and cook in a low oven for about 2 1/2 -3 hours until the meat is tender (slightly less if you’re going to cool and reheat it). Check and stir the stew from time to time, turning the heat down a setting if it seems to be cooking too fast and half-opening the lid if the sauce needs reducing. When the meat is cooked check the seasoning, adding a little more vinegar if you think it needs it and an extra splash of beer to taste. I served this with a tray of roast sweet potatoes, onions and carrots and wedges of steamed Savoy cabbage but it would also be great with baked or boiled potatoes. The food news story of the past few days is that we're all getting back into baking. I'm not sure that isn't one of those slightly whimsical ideas the media gets into its collective head (I can't smell any baking smells wafting from our neighbouring flats) but it's a nice, comforting thought anyway. I must confess I'm not an avid baker - which is just as well otherwise I'd be the size of a house - but I did come up with a really great recipe for The Frugal Cook which I adapted from a splendid book called Best Kept Secrets of the WI: Cakes and Biscuits. It's not terribly thrifty (or healthy, let’s face it) but even frugal cooks deserve a treat. And it does involve economies. Leftover coffee. Cocoa instead of chocolate (for the cake at least) and buttermilk spread instead of butter. If you're planning to join the ranks of the New Bakers, give it a go. Turn the oven to 180°C/350°F/Gas 4. Sift the cocoa into a large bowl, pour over the hot coffee and stir. Add the caster sugar, stir then tip in the spread, eggs and half the self-raising flour and beat thoroughly together with a wooden spoon or an electric hand whisk. Fold in the remaining flour. Spoon the mixture into the tin and level the surface. Bake for about 35-40 minutes until well risen and firm to the touch. Leave in the tin for 10 minutes then carefully tip out on a wire rack to cool. To make the icing break up the chocolate and put it in a basin with the butter and coffee or milk. Place the bowl over a pan of hot water, taking care that it doesn’t touch. Once the ingredients have melted remove from the heat and beat in the sifted icing sugar. Return the cooled cake to the tin, spread the icing evenly over the surface and leave to set for a couple of hours. Cut the cake into 12-16 squares or bars - or smaller pieces if you prefer. Great news: I've finally got a couple of advance copies of the book which looks really amazing. This is the 18th book I've written (must be mad!) but it's always a thrill when you finally get your hands on the first copy*. A bit like having a baby - it makes all the pain worthwhile! I gather it's basically a re-issue of her 1985 paperback, presumably with photography given the cover price of £17.99. Loads of people will buy it simply because it's a new Delia but I do hope they - and the media - give 'Frugal' which is very much written from a 2008 perspective, a look-in too. Matt, the designer, has done a really terrific job on it as you can see above. * You'll have to wait a couple of weeks longer, I'm afraid. Books should be in the shops by the end of the month. Our best buy at the Dartmouth farmers’ market we shopped at on Saturday morning was two trays of pheasant legs at £2 each. (£2 a tray, not £2 a leg!) From a real farmer which, it has to be said, is unusual at farmers’ markets these days. I don’t know about you but I’m getting more and more disillusioned with them. Most seem to be full of stalls offering overpriced cupcakes and chutneys. 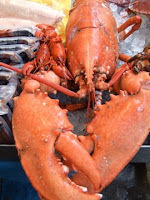 Very few offer genuinely local food. And why is it that the only cooked food being produced seems to be burgers and sausages? Surely someone has the wit and imagination to produce something a little different - like the raclette I wrote about on my cheese blog the other day. My contribution to the proceedings was some braised carrots (3 from a kilo bag from Tesco which cost only 45p) and some sprouts from the farmers’ market (about 45p worth) which I stir-fried with a splash of light soy sauce, some water and a few drops of sesame oil (OK, I admit that was a bit of an indulgence too) Total cost, provided you’ve got a well-stocked store cupboard and some leftover booze, £1.50 a head. Not bad for a slap-up Sunday night supper. Well, that's what I'm predicting anyway. Who's going to be spending a couple of hundred quid on a snooty designer hotel when a homely B & B (Bed & Breakfast) offers equal comfort for a third the price? And the price - just £76 for two including a more than generous English breakfast (below). A happy end to a somewhat scary week. In the Indy's 10 best autumn cookbooks! And it is, I hear, finally on its way. It's being printed overseas, as most books are these days - in 'Frugal's' case in Dubai - and should be in the bookshops in the next couple of weeks. I hope . . .
Just a useful link from the Guardian's money pages today - 50 ways to save money online. Well it couldn't be better suited to these hard times. Home made short crust pastry is cheap and simple to make. Leeks are in season, Stilton curiously underpriced compared to other blue cheeses, eggs and single cream (I could have used milk) still reasonably priced. There was easily enough for six. The downside again is time. You have to make the pastry, rest it, line the flan tin, ideally chill the case, bake it blind, first with baking beans and then without then finally bake it with the filling and cool it down. (Cold or room temperature quiche is much nicer than hot quiche.) But it's a nice thing to do on a Sunday afternoon and if I wasn't in the middle of testing umpteen other recipes I'd probably have made two. So when did you last make a quiche? Are you a fan or do you find them just too much of a palaver? 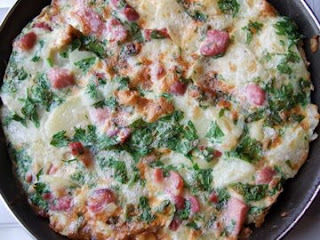 It's a sign of the disfavour into which French food has fallen that we'd rather talk about frittatas than omelettes these days. Even though they're virtually the same. We also buy pancetta cubetti rather than bacon bits - at about 3 times the price. There's a lot in a name. Anyway, this simple meal was prompted by good old bacon - a small bag of offcuts that I spotted in a local butcher yesterday for just 35p. I also had a leftover cooked potato and some parsley to use up, some eggs and an onion (which one should never be without). I went through the bacon offcuts and trimmed off the excess fat then tipped them into a frying pan in which I'd heated 2 tablespoons of vegetable oil and fried them for a couple of minutes. (If the bacon had been watery I'd have discarded the liquid at this point and put fresh oil in). I then added a large chopped onion (probably about 200g) and fried the mixture for another 7-8 minutes or so until the onion started to brown. I added the sliced potato and carried on frying for another couple of minutes then tipped in 5 large eggs, beaten with a handful of chopped parsley and seasoned with salt and pepper. Even so, it was a good cheap lunch. I spent the last couple of days in Dublin, judging the World Cheese Awards (see right). You can read more about it on my cheese blog, The Cheeselover, but there was one thing I wanted to share with you here. 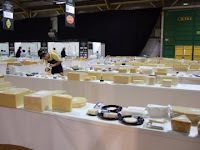 At the end of the judging all the cheeses - some 2000 of them, worth thousands of pounds were apparently destroyed, for 'health and safety' reasons. They were apparently going to be rendered into 'cheese powder' whatever that is. I'm sure the organisers are abiding by the letter of the law. Some of the cheeses were laid out overnight and certainly it would have been foolish not to dispose of the more perishable ones. But not to do anything with the aged cheeses which would have been perfectly edible is complete madness. As a cheeselover it makes me indignant. As an ordinary member of the public thinking about the use to which all that good food could be put I feel just plain angry. I'm sure this is not the only example of profligate waste. Shops and restaurants have to throw away perfectly good food all the time. Isn't it about time we introduced some common sense into the regulations and treated our fellow citizens as grown ups capable of making their own choices about whether food is fit to eat or not? It's been a bit of a crazy week in Bristol. The long-awaited £500 million shopping centre Cabot Circus has just opened with huge razmatazz. We went down for the opening of Harvey Nichols (a friend was doing the PR!) which bizarrely included a striptease by Dita Von Teese. There are apparently 25 (twenty five) restaurants in the new development. How will they possibly fill them all? Anyway, I digress. A recipe, and not before time. After the Harvey Nix bash we went round the corner to a brilliant new food shop and café in St Nicholas market called Taste@ St Nicks. I expected the prices to be food hall standard but they were surprisingly reasonable for the quality. 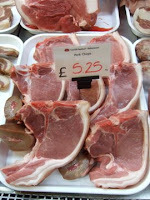 They also supply restaurants in the West Country and sell to consumers at roughly the same price as they sell to chefs. They had some fantastic pork chops (above) which reminded me we hadn't had this classic French bistro recipe, which comes from my student book Beyond Baked Beans Budget, for a while. Hope you enjoy it. Heat a medium sized frying pan and add the oil. When it’s hot add the butter, then lay the pork chops in the pan. Brown for about 2-3 minutes on each side, then turn the heat down and cook for a further 3 minutes or so each side depending how thick they are. Remove from the pan and set aside on a warm plate. Cook the mushrooms in the remaining oil and butter until lightly browned. Scoop them out and add to the pork. Pour in the wine or stock, add the thyme and bubble up until the liquid has reduced by about two thirds. Take the pan off the heat and stir in the cream or crème fraîche and mustard then warm through gently taking care not to let the sauce boil. Season with salt and plenty of black pepper (and a squeeze of lemon juice if you're using cream rather than crème fraîche). Return the chops and the mushrooms to the pan together with any juices, heat through for another couple of minutes then serve with boiled new potatoes or buttered tagliatelle and some green beans or broccoli, I suggest. News in the Guardian today that Waitrose is to start selling Bath chaps, ox cheeks and trotters from next month. Which sounds like good news except for the fact that it will almost certainly drive the price of these thrifty cuts up. Lamb shanks, once a cheap food, are no longer a bargain buy. Ox cheeks (which are delicious) will probably follow suit, particularly if the other supermarkets decide they have to stock them too. And I wonder how many people will actually cook with them? I must confess that even when I was researching The Frugal Cook I didn't use any of them (though I did use ox liver, scrag end of lamb and ham hocks). It takes time and time is what most people are short of these days. Although I wouldn't describe myself as a chocaholic I do have a weakness for fine dark chocolate which I justify on the basis that it's good for me. I'm always on the lookout for the perfect bar but until this week the ones I've liked have all been pretty pricey. Except for one we buy in France which it would be pointless to recommend to you here. Now I - or to be strictly truthful - my husband has found a really superb one in the Sainsbury's Taste the Difference range. 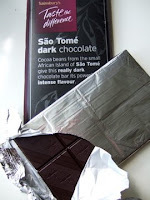 It's called São Tomé and comes from the African island of the same name which I'm embarrassed to admit I'd never heard of. It not only has a really deep, rich chocolatey flavour but a fabulous velvety texture that I think would probably make the ultimate chocolate mousse. Not that it isn't divine to nibble on its own . . .
And the best bit is that it only costs 99p for a 100g bar. Isn't that just about the best news this week? It's hard to read today's headlines without a shudder. Even though city boys, who for years have enjoyed ludicrously inflated bonuses, might not be the immediate object of our sympathy you have to feel sorry for the hundreds of ordinary people who have lost their jobs. And there will be more casualties, of that I'm sure. Losing your job is tough. It's not just the financial implications, worrying though they will be to those who are mortgaged to the hilt. It's the loss of identity that is bound up in a job and the consequent lack of self worth that often ensues. Adapting to a situation where you have to think about every penny you spend, an experience already familiar to many, won't come easy. I hope this blog, for those who read it, can at least make cooking and eating on a budget enjoyable rather than daunting. This week has been dominated by the produce I bought from the Organic Food Festival. Cooking it hasn’t quite gone to plan as I had to go to London for two days but earlier in the week I used the beets to make a favourite soup which my daughter Jo invented - carrot borscht. The addition of carrots - and a skinned tomato - is an inspiration. It sweetens the soup and rounds out the flavours. The original version also had bacon in it. No bacon, so I added a couple of slices of some smoked Manx Loaghtan lamb I’d been given to try. A reckless extravagance in a way but a) it was free and b) had the requisite smoky flavour I was looking for. Necessity is the mother of invention. Speaking of which, last night’s soup was even thriftier if anything. Got back early evening from London and couldn’t face sploshing (it was raining of course) down to Tesco. So I rooted around in the storecupboard and fridge and came up with the recipe below. The starting point was a packet of chard which I’d forgotten and was on the verge of going off. I thought of combining that with cannelini beans (happily found a can in the cupboard) then remembered there was still some chicken stock, a couple of slightly squishy tomatoes, some really pungent basil and those fabulous parmesan rinds. Voila, an Italian-style bean soup. Hope you enjoy it! Heat the olive oil in a saucepan over a low heat and add the onions and garlic. Stir, cover the pan and leave over a low heat for about 5 minutes until the onion has started to soften. Add the chopped tomatoes, replace the lid and cook for another 5 minutes until the tomato starts to break down. Roughly chop the basil leaves and stir them in then add the parmesan rind and stock and bring to the boil. Add the beans and simmer for another 5 minutes or so. Finely slice the chard or spinach and add to the pan. Cook another few minutes then remove the parmesan rind and season to taste with salt and black pepper. 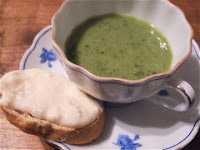 Serve the soup with some shaved or grated parmesan or with a drizzle of olive oil. A new book project (cheese). A new blog - The Cheeselover. Must be mad but here's the thinking. I could write about cheese on The Frugal Cook but it would take the blog over for the next few months and cheese, as we all know, is far from frugal these days. It also helps, I've found, writing a blog as you write a book. Book writing is a long and lonely journey and you don't see any results for months but blogging is immediate and gratifying, enabling you to share the ideas and thoughts you have as you go along with fellow enthusiasts. You can also take and share your own photos which publishers understandably won't let you do ;-) Or won't publish them anyway. That doesn't mean I'll be abandoning TFC or never posting about cheese. In fact to allay any worries you may have here's a pic of the glorious cheese rinds I scrounged from The Parmesan Cheese Co at the Organic Food Festival at the weekend which I shall add to the soup I'm making from the carcass of the half-price organic chicken I bought (which has already provided two meals). Fantastic in risottos too. When you buy cheese - if you buy cheese from an independent cheese shop - ask for some.